NATIONAL CITY — From the sky above National City, it would resemble a kite. From ground level it would present public art, a promenade and walkways. 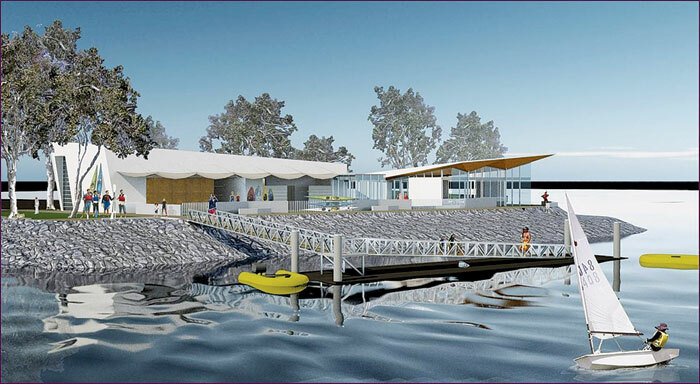 Visitors would be able to kayak and row in the neighboring waters or enjoy an opportunity for environmental education from inside its green facilities. These are all planned features of National City’s Aquatic Center, a 4,700 square-foot project that was originally targeted for completion in 2006. Seven years later, the future of the National City Aquatic Center is still just a twinkle in the eyes of Mayor Ron Morrison and a handful of engineers. There are more than $3 million in tax allocation bonds that have been allotted to the project, none of which have been approved by the state’s department of finance. “We’ve got $ 4 million sitting in the bank — and, in the meantime, we’re still paying taxes on it, basically throwing it away,” Morrison said. If that money gets released by the state, the city will use it for park improvements, Morrison said. For now, the city will rely on $830,000 in reallocation from National City park projects and other funding to use for the Aquatic Center construction. The Port of San Diego and the city agreed to the lease and date of construction last January, giving the city until Dec. 31 to begin construction. All heavy construction will have to be completed by late January of the following year, as birds of the area will begin nesting at that time. The port has been issued a coastal development permit for the project and was granted a two-year permit extension, giving the city till Aug. 2, 2015 to complete construction — unless the port agrees to offer an additional extension.